A pond skimmer is basically a pond filter that removes water and debris from the top of the pond, thereby "skimming" floating debris before it becomes waterlogged and sinks to the bottom. Materials for a homemade pond skimmer do not vary significantly from a homemade pond filter. However, the container varies in its construction to limit water intake to just the top inch or two of the pond. A pond skimmer helps keep water clean and clear. The container you choose for a pond skimmer is the most important part of its construction. A dark colored 5-gallon bucket with a lid works well. Cut out a 2-by-6-inch rectangle horizontally across the bucket, about 3 inches from the lid. This will be the intake. Place the bucket in the pond, using stones or an overturned plastic container to set the bucket so the rectangle is 1 inch below the water line. Place a stone in the bottom of the bucket to keep it from tipping over. Remove the stone from the bucket and drop a pond pump in. Mark and cut the bucket to allow the pump outflow hose to feed back in to the pond at or above the water level. Pack the area in the bucket above the pump with scrubbing sponges or a large piece of foam. This will act as a filter for the pond water before it reaches the pump. Once you power on the pond pump, the skimmer will begin to function. Water will flow in to the bucket through the rectangular hole. Debris such as leaves and grass clippings will become stuck inside the top of the bucket where you can safely remove them using your hands or an aquarium net. 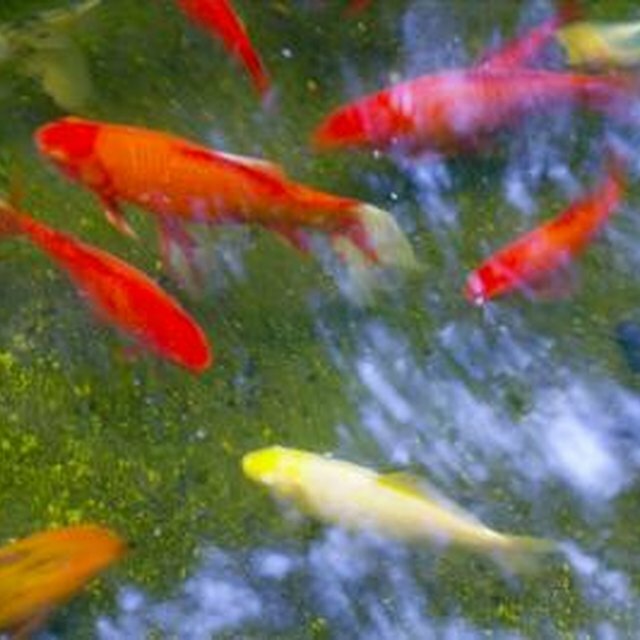 The foam or scrubbing sponges will prevent debris from clogging the pond pump should you neglect to clean the skimmer for a few days. If you have fish, omit adding scrubbing sponges or foam to the bucket skimmer as fish may become trapped and drown. The rectangular hole should allow any fish that get into the skimmer to easily escape. Nonetheless, when removing debris from the skimmer ensure you are not grabbing fish with the leaves and litter.